I made this for a friend's baby's first birthday. It's a simple tent folded card A4...the card was mat and layered and I used a Happy Birthday embossing folder for the background. I inked it over lightly with ink from the Hobbycraft range. I used pink Hunkydory checked paper in the matting. I used Spellbinders dies for the border and the sentiment holder ... added some pretty pink ribbon and lightly glittered the embossed part of the card. I also added a few pink and white pearls to the card. 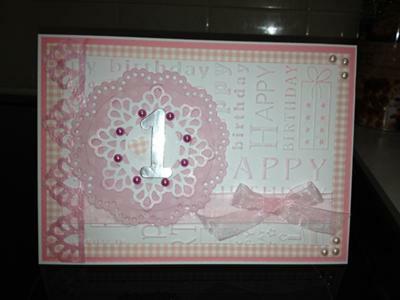 What a very pretty card and I love the Pink ...it is my favorite colour especailly for baby cards. The result is always so delicate and of course Gingham is the most popular choice for them. As a new card maker I am happy to hear that you are finding lots of things to help you in the process ... as you are the people that this website was aimed at when I started it three years ago. Flowers, Ribbons and Pearls is the name and I look forward to seeing you there. Very beautiful card Mandy...so cute! very pretty card so delicate the shade of pink. A very pretty card. Well done! What a pretty card - must congratulate you if you have only been making cards for a short time - it's beautiful.